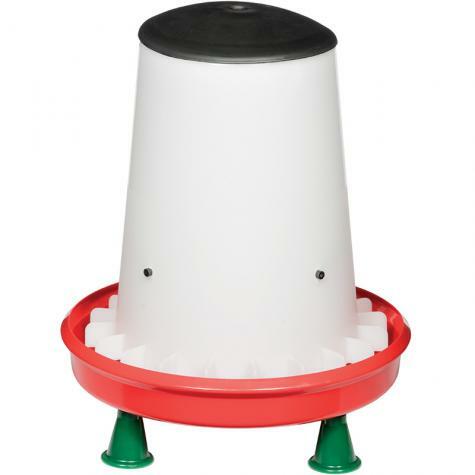 Sturdy construction and high quality plastic make the feeder suitable for all types of birds including chickens and pheasants. Grill may block wide billed waterfowl. 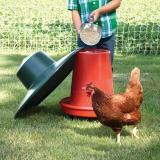 Protect your chicken feed and reduce waste by using a Handy Rain Hat with the Handy Feeder. To feed chickens and pheasants. Includes a set of 4 push fit legs that elevate the feeder 3" off the ground. 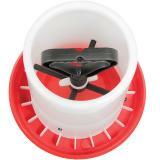 Clever internal, adjustable carry handle controls feed flow and also enables feeder to be hung. 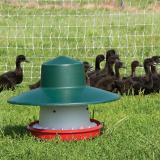 Rain hat (sold separately) protects feed from rain and snow. 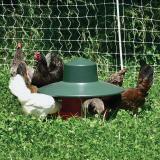 This rain hat fits on top of the eco or handy poultry feeders to protect feed from rain and snow. 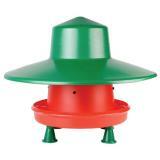 Use to adjust the height of poultry waterers and feeders. This is my 2nd feeder like this. I totally love it! I am still using the first one but its so old it starting to break apart from the upper rim from surviving wicked cold winters and hot summers. I like the grill in the bottom of food hopper so they cant scatter it out and waste it. I love the carry handle. I have not found any other feeders with a good carry handle. I like the size, the diameter and it holds 20 or 25 lbs (although I dont put that much in it. 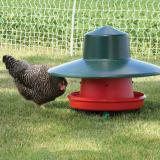 This is a handy long lasting sturdy feeder! I have lots of other types and they sit in the storage shed. You will love this feeder! Love this feeder. Left 40 chickens for four days with this feeder. Works great, stable and high enough that the grate/bowl doesn't fill with debris and pine shavings. Didn't get the hat, but the lid stayed on and no one has tried to roost on it. Definitely ordering a second one. Love this feeder. Food has stayed dry through a tropical storm. We've been using this for about a week. I didn't have much problem regulating the feed flow. Only had to adjust it a couple of times, and it works just fine. One of my hens has a scissor-beak, and she's eating well (and easily) from this because I was able to create as much depth as she needed so that she doesn't have to work as hard for her feed. Be sure to adjust the depth to your needs before filling it completely, as once it is full it is impossible to turn the inner crank. 5 stars so far. 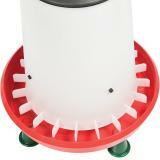 I purchased this to replace the Blenheim feeder purchased a couple of years ago. It simply did not keep the feed flowing fast enough! This one seems to fit the bill. (or beak) Like the adjustment inside.